RNC: What Should Mitt and Ann Romney Do in Tampa Bay? Happy Monday Tampa Bay! Erica back—and with a huge favor—Presidential Candidate Mitt Romney and his wife Anne need your help! Between the entire United States and over 15,000 media persons watching, Mitt and Ann Romney will need a little downtime. We are reaching out to residents and friends of the region to select the top five things Mitt and Ann Romney (and other RNC delegates) can do in Tampa Bay at the Republican National Convention. The polls are open but you have only through this Wednesday, July 11 to cast your vote. Let us know what you think Mitt and Ann must experience in Tampa Bay by selecting from a list, or suggesting your own idea. Whether it’s a jog down breezy Bayshore Boulevard or a dive with the sharks at the Florida Aquarium, the choice is yours. To help plan Mitt and Ann’s trip, click here. So spread the news about this survey to friends, family, colleagues, coworkers, employees and others. Help by posting the survey link on your Facebook and Twitter pages so that everyone will know about the survey. 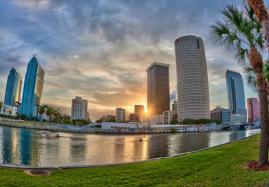 That’s it for now, but check out http://www.visittampabay.com/ for more information about Tampa.